April 3, 2014; The result of "MedTech" Medical Technology Licensure Board Exam held on Mrach 30-31, 2014 were released 3days after by The Professional Regulation Commission (PRC) wherein 885 passed out of 1,252 Students who took the board exam. Bachelor of Science in Medical Technology in the Philippines "BSMT" is a four year college degree program that prepares the students with knowledge and skills about laboratory tests used primarily to help in detection, diagnosis, prevention, and treatment of diseases. Every students who graduated as BS in Medical Technology needs to take the Medical Technology Board Examination before he/she can practice his/her profession. 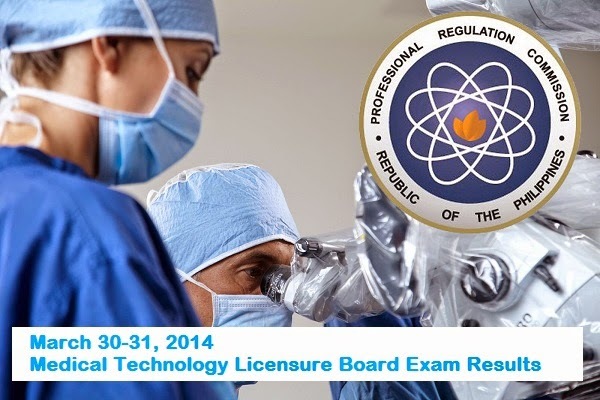 The Board of Medical Technology facilitates the exam under the supervision of the Professional Regulations Commission (PRC) and it is scheduled twice a year in the months of September and March. The MedTech Board Examination consist of the following 6 major subjects; , Microbiology and Parasitology, Clinical Chemistry, Hematology, Blood Banking and Serology, Clinical Microscopy (Urinalysis and other body fluids), and Histopathologic Technique. In order to pass the MedTech licensure board examination, a board examinees must obtain a general weighted average of at least 75% with no rating below 60% in all 6 major subjects.